Edmund of Woodstock, 1st Earl of Kent (5 August 1301 – 19 March 1330) was the sixth son of Edward I of England, and a younger half-brother of Edward II. Edward I had intended to make substantial grants of land to Edmund, but when the king died in 1307, Edward II failed to follow through on his father's intentions, much due to his favouritism towards Piers Gaveston. Edmund still remained loyal to his brother, and in 1321 he was created Earl of Kent. He played an important part in Edward's administration, acting both as diplomat and military commander, and in 1321–22 helped suppress a rebellion against the King. Discontent against the King grew, however, and eventually affected also Edmund. The antagonism was largely caused by Edward's preference for his new favourites, Hugh Despenser the Younger and his father. In 1326, Edmund joined a rebellion led by Queen Isabella and Roger Mortimer, whereby King Edward II was deposed. Edmund failed to get along with the new administration, and in 1330 he was caught planning a new rebellion, and executed. Edward I of England had a great number of children with his first wife, Eleanor of Castile, but only one son who survived into adulthood – the future Edward II (born 1284). [a] After Eleanor died, the king married Margaret of France, with whom he had two children: Thomas (born 1300) and, when the king was sixty-two, Edmund. [b] Edmund was born at Woodstock in Oxfordshire on 5 August 1301, and was therefore referred to as Edmund of Woodstock. Son of the English king, he was also, through his mother, grandson of Philip III of France. On 7 July 1307, before Edmund had turned six, King Edward I died, leaving Edmund's half-brother Edward to succeed as King Edward II. Even with Lancaster defeated, the battle against the rebels was not over. Edmund was charged with overtaking Wallingford Castle from Maurice de Berkeley in January 1323, a task which he fulfilled with great success. For his loyalty, Edmund was rewarded with substantial holdings in Wales, primarily land forfeited by Roger Mortimer. [e] The greater part of the spoils of war, however, went to the Despensers, who both benefited greatly from the forfeiture of the rebels. By 1326, the Despensers, father and son respectively, enjoyed incomes of £3,800 and £7,000, while Edmund's annual income was at only 2,355 marks (£1,570). Meanwhile, the English king's possessions in France were coming under threat from the French king. Charles IV of France demanded that Edward again pay homage for his Duchy of Aquitaine,[f] while at the same time threatening to confiscate the duchy under the pretext of a local dispute involving the priory at Saint-Sardos. In April 1324, Edmund and Alexander de Bicknor, Archbishop of Dublin, were sent to France on a diplomatic mission. While some historians have criticised Edmund for his failure to reach a diplomatic settlement, others have pointed to the difficult circumstances he faced, and how others had fared little better. When diplomacy failed, Edmund was appointed Edward's lieutenant in Aquitaine on 20 July 1324. Though there was a desperate need for reinforcements from England, these never arrived. In the short war that followed, the English lands were quickly overrun by the French, and Edmund was besieged at La Réole. Here he held out until 22 September, at which point he was forced to surrender and agree to a six-month truce. Queen Isabella with the captive Hugh Despenser the Elder and the Earl of Arundel. From a 15th-century manuscript. In September, Isabella and Mortimer invaded England with mercenary soldiers, and Edmund took part in the invasion. The invasion won the support of a great part of the English nobility, including Edmund's brother Thomas, and Henry, Earl of Lancaster, Thomas of Lancaster's brother. Edmund took part in the trials of the two Despensers, and in the council transferring power to Prince Edward, who was crowned King Edward III. For his participation in the coup, Edmund received a reward of land belonging to the Despensers, and the Earl of Arundel, who was also executed as a supporter of Edward II. As the Northern situation was still difficult, Edmund was given joint command of the Scottish Border with Lancaster, but the two fell out, and Lancaster was soon after given sole command. 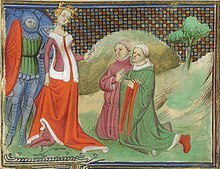 It did not take long for Edmund to grow disenchanted with the new regime; one source of contention was the dominant position at court of Mortimer, who has been described as Isabella's lover. In the autumn of 1328, Edmund and his brother Thomas joined Henry of Lancaster in a conspiracy against Isabella and Mortimer. The conspiracy was a product of shared interest, however, rather than strong personal ties. Once it became clear that it would fail, the two brothers abandoned the venture. After participating in the planned rebellion, Edmund became less popular at court. He was still allowed to accompany the king's wife Philippa to her coronation in February 1330, but his appearances at court became less frequent. At this point he became involved in another plot against the court, when he was convinced by rumours that his brother was still alive. [g] It later emerged that Roger Mortimer himself was responsible for leading Edmund into this belief, in a form of entrapment. The plot was revealed, and in the parliament of March 1330 Edmund was indicted and condemned to death as a traitor. Upon hearing that the verdict was death, the condemned earl pleaded with Edward III for his life, offering to walk from Winchester to London with a rope around his neck as a sign of atonement. Edward III however knew that leniency was not an option for the aforementioned entrapment utilized by Mortimer could extend to him and potentially be subversive to his own kingship if his father, Edward II truly was alive. Thus Edward III sanctioned the killing of his uncle. It was almost impossible to find anyone willing to perform the execution of a man of royal blood, until a convicted murderer eventually beheaded Edmund in exchange for a pardon. Edmund's body was initially buried in a Franciscan church in Winchester, but it was removed to Westminster Abbey in 1331. The execution of a royal prince was a great provocation to the seventeen-year-old Edward III, who had not been informed about the decision, and it probably contributed to the king's decision to rise up against his protector. In October 1330, Edward III carried out a coup installing himself in personal control of government, and Mortimer was executed. Among the charges against Mortimer was that of procuring Edmund's death, and the charges against the late earl of Kent were annulled. In late 1325, Edmund had married Margaret Wake, sister of Thomas Wake, Baron Wake of Liddell, and the couple had several children. His lands and titles descended on his oldest son by the same name, but this Edmund himself died in October 1331. The earldom then passed to the younger son John. Edmund was not particularly popular while he was alive, nor did he enjoy a good reputation after his death. His unreliability in political issues, and repeated shifts in allegiance, might have contributed to this. His household was also said to behave in a way that caused popular resentment, taking provisions as they passed through the countryside while offering little compensation. At the same time, it has been pointed out that Edmund showed a great deal of loyalty to Edward II, in spite of receiving relatively little rewards and recognition from his brother. Margaret 1327 1352 Was to marry Arnaud Amanieu, Lord of Albret but the plans fell through. Joan of Kent 28 September 1328 7 August 1385 Known as "The Fair Maid of Kent". Married Thomas Holland, 1st Earl of Kent, and later Edward, the Black Prince, son of Edward III. Edmund is a character in Les Rois maudits (The Accursed Kings), a series of French historical novels by Maurice Druon. He was portrayed by Eric Kruger in the 1972 French miniseries adaptation of the series. a. ^ A detailed account of the children of Edward I can be found in Michael Prestwich's biography of the king. ^ Marshall (2006), p. 190. ^ a b c d e f g h i j k l m n o p q r Waugh (2004). ^ Prestwich (1997), pp. 556–7. ^ Marshall (2006), p. 197. ^ a b Lawne (2010), p. 28. ^ Lawne (2010), p. 29. ^ a b c Lawne (2010), p. 31. ^ Prestwich (2007), pp. 188–9. ^ a b Lawne (2010), p. 30. ^ Phillips (1972), p. 192. ^ Prestwich (2007), pp. 197–8. ^ Prestwich (2007), p. 198. ^ McKisack (1959), p. 66. ^ a b Lawne (2010), p. 33. ^ Barrow (1965), p. 317. ^ Lawne (2010), p. 32. ^ Phillips (1972), p. 229. ^ Prestwich (2007), p. 303. ^ Phillips (1972), p. 232. ^ McKisack (1959), p. 109. ^ a b Lawne (2010), p. 34. ^ McKisack (1959), pp. 108–9. ^ Lawne (2010), p. 35. ^ Prestwich (2007), p. 215. ^ McKisack (1959), p. 93. ^ McKisack (1959), pp. 82–3. ^ Tuck (1985), p. 90. ^ Tuck (1985), p. 97. ^ Haines (2003), p. 216. ^ Tuck (1985), pp. 99–100. ^ a b McKisack (1959), p. 100. ^ Prestwich (2007), p. 223. ^ Lawne (2010), p. 47. ^ Given-Wilson (1996), p. 33. ^ Prestwich (2007), pp. 223–4. ^ Tuck (1985), p. 103. ^ Powicke (1961), p. 434. ^ Lawne (2010), pp. 46–7. ^ Prestwich (1988), pp. 122–33. Barrow, G. W. S. (1965). Robert Bruce and the Community of the Realm of Scotland. London: Eyre & Spottiswoode. ISBN 9780748620227. Denholm–Young, Noël (1969). The Country Gentry in the Fourteenth Century: With Special Reference to the Heraldic Rolls of Arms. Oxford: Clarendon. ISBN 0198223013. Given-Wilson, Chris (1996). The English Nobility in the Late Middle Ages. London: Routledge. ISBN 0415148839. Haines, Roy Martin (2003). King Edward II: Edward of Caernarfon, His Life, His Reign, and Its Aftermath, 1284–1330. Montreal, London: McGill-Queens University Press. ISBN 9780773524323. Maddicot, J.R. (1970). Thomas of Lancaster, 1307–1322. Oxford: Oxford University Press. ISBN 0198218370. OCLC 132766. Phillips, J.R.S. (1972). Aymer de Valence, Earl of Pembroke 1307–1324. Oxford: Oxford University Press. ISBN 0198223595. OCLC 426691. Powicke, Maurice; E.B. Fryde (1961). Handbook of British Chronology (2nd ed.). London: Royal Historical Society. Prestwich, Michael (1980). The Three Edwards: War and State in England 1272–1377. London: Weidenfeld and Nicolson. ISBN 0297777300. OCLC 185679701. Prestwich, Michael (1997) . Edward I (updated ed.). New Haven: Yale University Press. ISBN 0300072090. Waugh, Scott L. (2004). 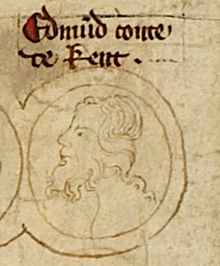 "Edmund, first earl of Kent (1301–1330)". Oxford Dictionary of National Biography. Oxford: Oxford University Press. doi:10.1093/ref:odnb/8506.